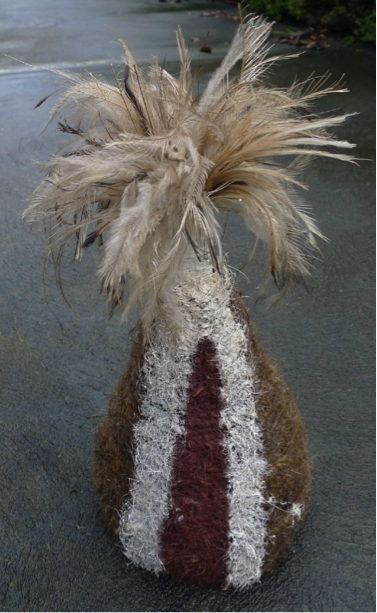 The Leeds example has an old label: "Head ornament of emu feathers worn by aboriginal men at some of their dances. N.Queensland”. Unfortunately the source details are lost, and now recorded as Unknown. The date is estimated at 1890-1920. 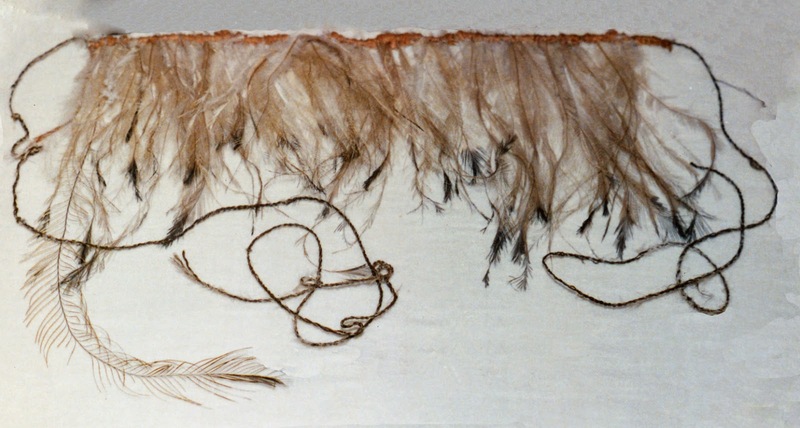 This took me to a photo of a similar headdress at the National Museum of Australia which has lots of contextual historical detail. This group of engraved brown nut shells are presumed to be gambling tokens, one is said to be carved with a sexual symbol.. they are used in a gambling game banned for its destructive influence. Sudan. Len Pole says see similar examples at Powell-Cotton museum. I had not come across anything like these before, but some of the designs look similar to modern gourd carvings from West Africa, particularly one piece from Ghana, which is possibly Asante. Carved gourd ornament, Ghana, 1960-1980. Leeds LEEDM.F.2009.5.30. Transferred from Hampshire County Museum and Archive Service. 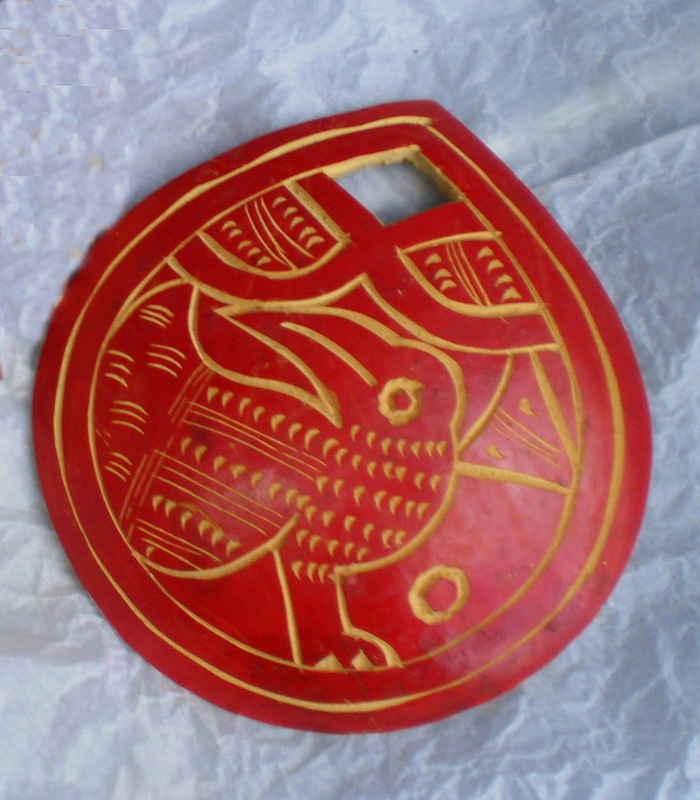 I checked out Brazil seed carvings on this website but nothing similar there. There is a huge range of game counters illustrated on these pages at Etsy, but again no direct similarities, and nothing either here which has a good list with short descriptions and illustrations of the different board games in Africa. This is described as “Santali instrument an aboriginal tribe of N. Bengal, wood with bird ornament on top and hanging wooden blocks below”. Wikipedia now has a detailed well-referenced entry on the Santhal or Santal people of India, and they were one of the peoples whose art featured in the Quay Branly exhibition ‘AutreMaitres de L’Inde’ (Other Masters of India) in 2010. However, I found this website difficult to read, and it seems to link closely to another exhibition in Germany on Santal musical instruments. There was nothing here on Santal rooster bird puppets or bird scarers, and similarly there is nothing in another website I was hoping would be useful here. MEG and Bexhill would love to hear from anyone who has seen similar items to these, or has them in their museum collections. The contact at Bexhill Museum is Julian Porter.